Dolce & Gabbana doesn’t shy away from embracing and upending Italian stereotypes. Their ad campaigns feature glammed-up grandmas partying in front of majolica plates, dapper men draped in bunches of garlic and elegant women downing pasta while taking selfies. So perhaps it’s no surprise that they recently partnered with pasta company Pastificio di Martino to release a limited edition packaging for the company’s most classic shapes. 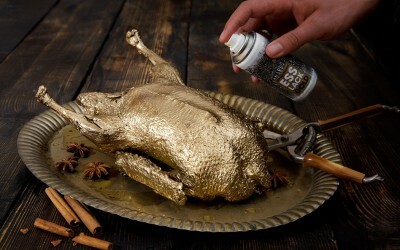 This isn’t the first time Dolce & Gabbana has brought food into the fashion fold. Earlier this year, the company partnered with Smeg to release an exclusive range of brightly patterned domestic appliances. 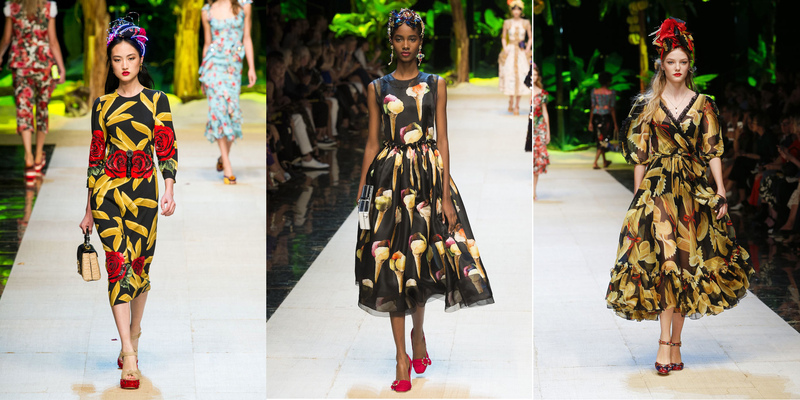 In September, Dolce & Gabbana presented dresses made from fabric printed with an assortment of pasta shapes as part of their Spring/Summer 2018 collection. Previous ad campaigns have featured food as a prominent part of their brand identity, whether with models sitting down to eat or as a background market setting. In this sense, the partnership with Pastificio di Martino positions Dolce & Gabbana as a lifestyle brand that operates on every level of Italian culture. This is the first such partnership for Pastificio di Martino, which has been producing dried pasta extruded through bronze dies since 1912. Their pasta is made from 100% Italian durum wheat and is praised by the likes of Slow Food for its non-sticky, al dente texture. The relationship between Pastificio di Martino’s all-Italian identity and Dolce & Gabbana’s cheeky rendition of retro-meets-modern Italian glamour demonstrates the potential for Italian heritage companies to move beyond tradition as they market themselves to a wider audience. Spaghetti, paccheri and pasta mista corta (leftover pieces typically used for soup), will each be packaged in the limited edition bags. 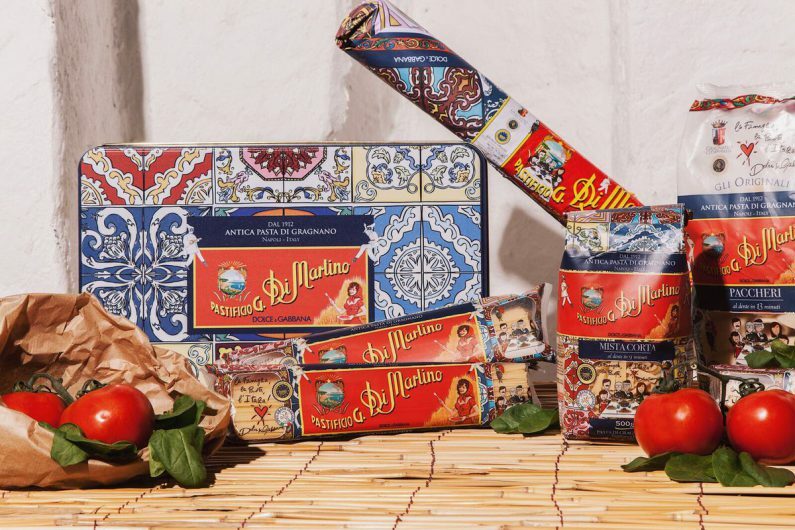 Whereas Pastificio di Martino’s packages typically feature red and blue bands on a transparent background, Dolce & Gabbana’s version swaps the transparency for images that look like elaborately decorated tiles that call to mind retro entryways, or a grandmother’s kitchen. There’s also a small line drawing that depict three generations of a happy family (two children, mom and dad, grandma and grandpa) sitting down to their pasta lunch. 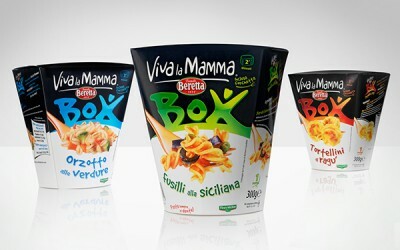 Each bag also features the slogan “la famiglia, la pasta, l’Italia!” (family, pasta, Italy). While the collection of these tropes on a bag of pasta might seem like a reductive depiction of Italian identity, they can also be thought of as merging foreign and local conceptions of what it means to be an Italian in a consumer society. 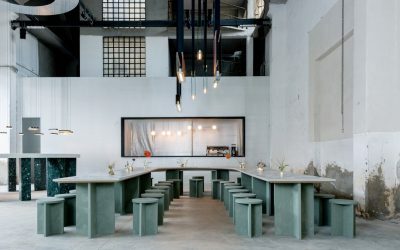 For foreigners, the appearance of these images confirms what they expect to find in an Italian food product—happy people eating pasta in a traditional setting. The familiarity of the images attracts them to this new pasta brand, while the fact that the package come from Dolce & Gabbana justifies it as an authentic portrayal of italianità. For Italians, the appearance of these images can be seen as upgrading an otherwise quotidian product. 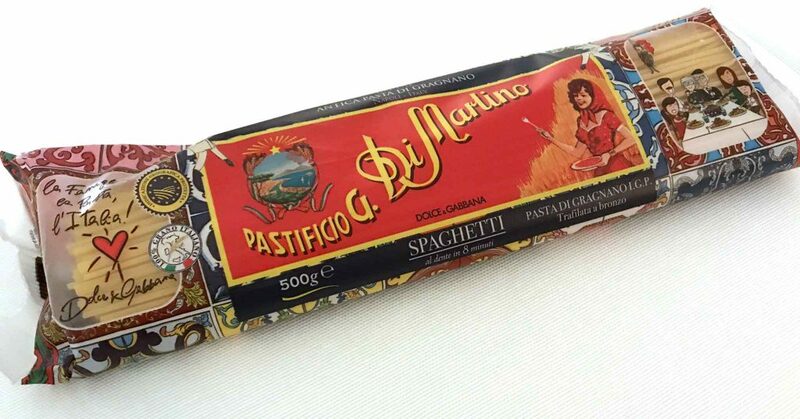 While Pastificio di Martino certainly has more gourmet cache than Barilla or Garofalo, they still sell a building block of the Italian diet (Italian eat roughly 26 kilograms of pasta per person annually). Add in the fact that this upgraded packaging comes from a fashion brand and this limited edition packaging presents an aspirational picture of everyday life for an Italian audience. The fashion house’s branded pasta packages will be available in extremely limited quantities. The line includes pasta tins and aprons, in addition to their regular bags with special designs. Limited edition tins will be priced at $110. 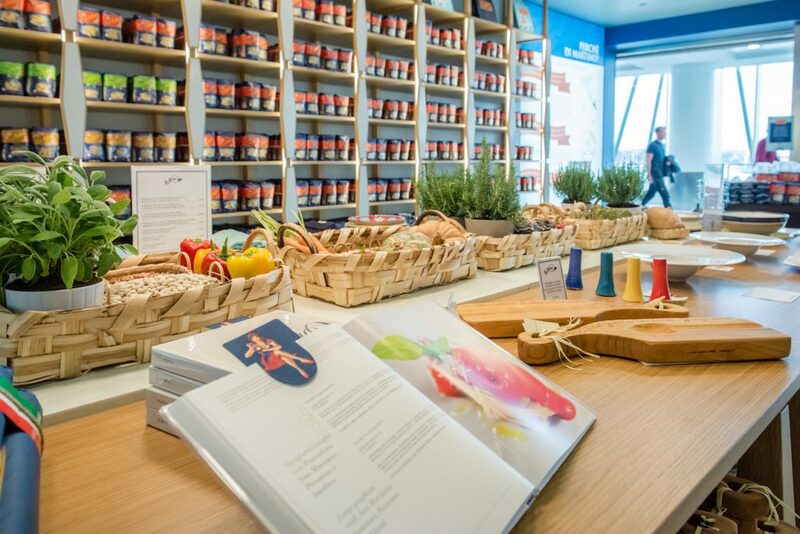 Bloomberg reports that only 5000 tins will be produced, with only 1000 available in the United States (head to Buon d’Italia’s store in New York’s Chelsea Market to get your hands on one). 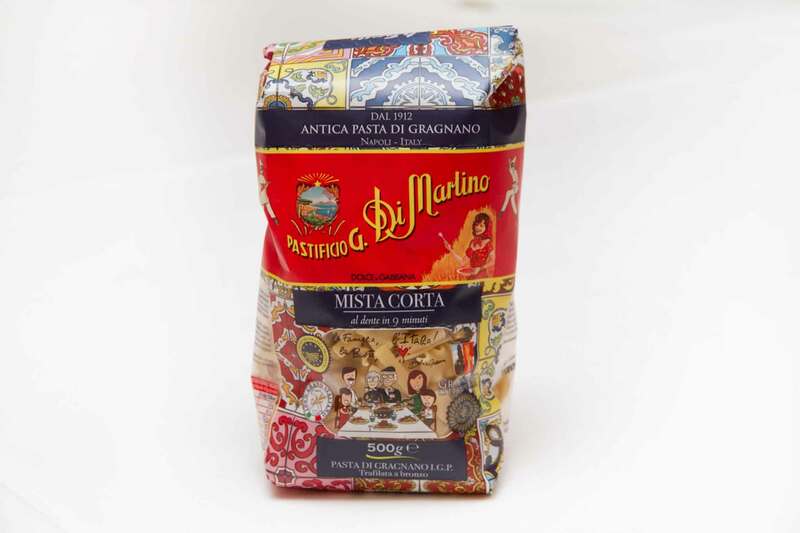 This partnership comes in advance of Pastificio di Martino’s planned expansion in the USA. 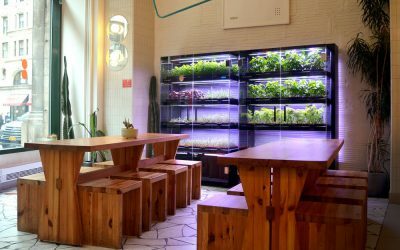 Their first US store is scheduled to open in downtown New York next year, but they already operate a variety of dedicated shops and kiosks throughout Italy. It will be interesting to see how the public responds to these products and whether they decide whether the hunt for such an expensive object is justified by its exclusivity. Food has certainly become an essential for the fashion set as of late and this collaboration seems to confirm the market potential of this relationship.